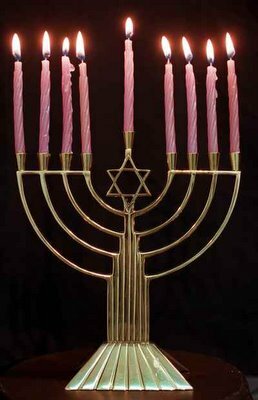 Bonfire of the Vanities: Hannukah for Christians? The Maccabees deserve to be revered by all of us for their faith and courage in the face of brutal persecution. This celebration has always touched me deeply. And I always send Hannukah cards to my Jewish neighbors. The feasts of the Old Testament are a great foreshadowing of the world's salvation. The Maccabees not only had a foretaste of the light in the symbolism of the lamp stand, they also knew the duty to pray and make offerings for the dead. I always thought it a bit strange that Hannukah is celebrated by Jews, but does not appear in their Bible. The book of Macccabees is included in the Catholic Bible, but Catholics do not celebrate Hannukah.